1 I can't get into the game. The loading bar is stuck. What do I do? 2 What is Diggy's Adventure? 3 Can I play this game with my friends? 4 How to change language? 5 How can I move the screen to see other parts of my camp or a mine? 6 What are the two bars in the upper part of the main screen? 7 What is energy for? 8 There are some buttons in the lower part of the main screen. What are they for? 10 Is building camp equip important? 11 My Kettle/other equip disappeared and I can't buy it again! 12 What do I need to do to unlock more space in my camp? 13 How can I unlock lower floors in my camp? 14 What are the materials for? 15 I have ran out of materials. What do I do? 16 How can I get bronze/any other material? 17 What are the gems for? 18 What is a windmill? 19 How can I get the Caravan Outpost and what does it do? 20 What does the map do? 21 What does a Repeatable mine mean? 22 I've encountered these strange round stones, what do I have to do with them? 23 What is the bubble shining above a character's head? 24 I have found a god child. What does it do? 25 Why do some of my friends have these strange icons? I can't get into the game. The loading bar is stuck. What do I do? First of all, check if you have the newest version of Adobe Flash Player (you can find out here ). If not, please install it. Second of all, try clearing your browser's cache and refresh afterwards (step by step walkthrough here). You may also try using a different browser. Lastly, the loading also depends on the speed and quality of your internet connection. Sometimes, however, a simple reboot of your router helps get the game up and running. If you have any other issues or suggestions for our game, feel free to contact us via our support. If you'd like to get to know other players, don't hesitate to visit our . Diggy's Adventure is a fun social game on Facebook full of logical puzzles and adventures. You can follow the story of Diggy and his father, complete various quests and interesting puzzles, level up, dig through many locations, take care of your basic camp, help your friends, hunt treasures and many others. Can I play this game with my friends? Yes, you can play with your Facebook friends. You can visit their own camps and help each other out through sending gifts and placing windmills. 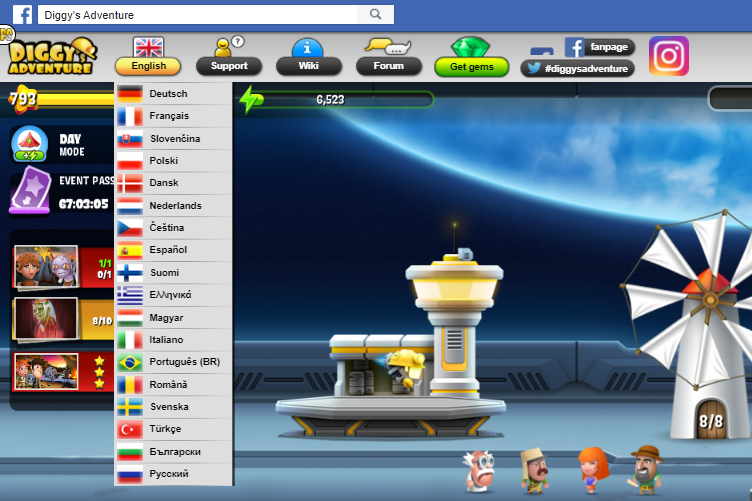 The language can be changed by clicking on a corresponding flag on the right side of the upper game menu. The game is currently available in English, German, Slovak, French, Polish, Danish, Dutch, Czech, Spanish, Finish, Hungarian, Italian, Portuguese, Romanian, Swedish, Greek, Russian and Turkish. How can I move the screen to see other parts of my camp or a mine? You can use click and drag system. The mouse button has to be clicked to grab the screen. The button has to be held down while the screen is moved ("dragged") to its destination/direction. Then the mouse button has to be released. What are the two bars in the upper part of the main screen? The number in the circle shows your level. The bar next to it (yellow) shows the amount of experience points you have gained and how many of them you need to reach the next level. The second bar (green) shows the amount of energy you currently have and the maximum cap. The upper right corner shows the amount of your coins, gems and button to see what materials you have currently in your inventory. Energy is needed for Diggy to dig tiles in order to fulfill various objectives. It refills with time according to the amount of regeneration speed. It refills even if the player is offline. Its maximum and regeneration speed can be changed by the camp equip setup. A player starts with 200 energy. The bar shows 200/200 when it's full. In this case, the maximum can be raised by camp equip, e.g. to 300/300. When a player eats some food or drink something energetic (or click a god child or get a levelup), they can raise the maximum to for example 350/300. At this point, the regeneration stops and the counter will start when the player reaches 299/300 again. There are some large tiles in the game (that need e.g. 600 energy) and by accumulating this additional energy is the way to dig them out. Hovering with mouse over the energy bar will show additional information. There are some buttons in the lower part of the main screen. What are they for? The lower left part shows your friend list. You can move through it by clicking the arrows to the right or to the left. It shows a friend's profile picture, first name and the little number indicates their level. By clicking on a friend's profile picture, you can visit their camp. Invite – you can send invitations to your Facebook friends. Journal – you can list through all the journal entries you have gained throughout the game. Shop – you can buy various items here (in the tabs camp equip, decorations, energy, extras and recommended). Inventory – you can store camp equip and decorations in here without selling it. Also, it shows items you have found on your adventures – food and drinks (in the energy tab), materials, quest items and windmills. 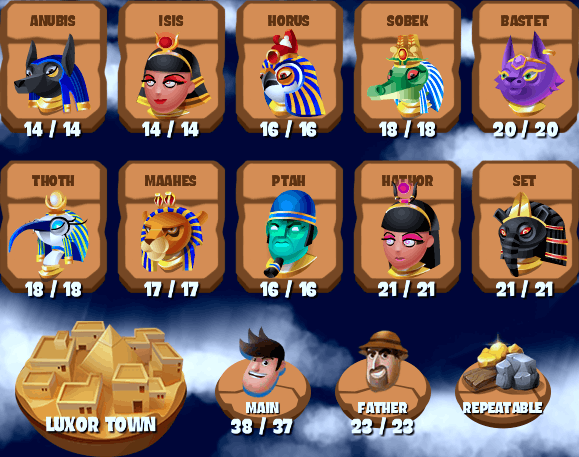 Pantheon – throughout the game, you have to search for pieces of broken stone plates of gods and your progress is shown here. Gifts – you can send various gifts to your friends and receive them too. Achievements and Treasures – you can complete various achievements and get rewards for them. Throughout the game, you can complete Treasures. Each treasure has several parts which can be found randomly by digging. If a player completes a treasure, they receive a decoration as a reward. Home camp – sends Diggy straight to the home camp without using the map. Map – opens map. It contains many locations to which Diggy can travel. Town – sends Diggy straight to the town without using the map. Last mine – sends Diggy straight to the mine which has been visited as last without using the map. At the end of this panel, there is a sound/music setting and a decoration lock. The decoration lock turns the interaction with the decorations on and off. Camp is a unique place where you can build your camp equip and decorations. Each player can customize the look of their camp according to their taste and need. Camp equip and decorations can be bought in the shop. Is building camp equip important? 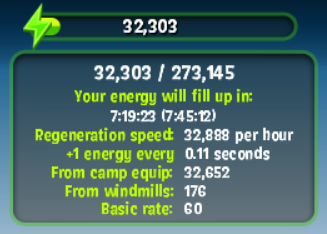 Capacity – add to the maximum energy cap. Changing the equip in the camp is essential. The best way to set up the equip is to have the capacity built when going away from the game for a longer time; have the regeneration equip when online for a longer time so the energy level refills quickly and in the meantime, e.g. use the production equip to cook food which instantly refills the energy level. Once a camp equip is bought, it can be put from the camp into the inventory and then back in the camp. My Kettle/other equip disappeared and I can't buy it again! It's probably in your inventory. Just click on the green backpack icon in the lower right part of the menu. 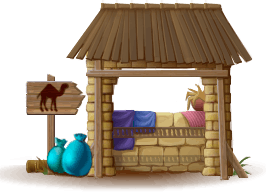 The first button – red tent – will show all your stored camp equipment. What do I need to do to unlock more space in my camp? More space in camp means more camp equip which gives you more energy! And that means that you can dig more and progress faster in the game. All you need to do is click on a bomb icon that appears on the currently removable debris spots. The window will inform you about what you need to unlock the particular spot. And be sure to aim for the spots with visible treasures. How can I unlock lower floors in my camp? What are the materials for? The materials are your resources which you need mainly for buying camp equip and decorations. I have ran out of materials. What do I do? There are material mines on the world map in the Repeatable tab. They are called repeatable because after they are cleared out completely, they are refilled after a certain amount of time. Another way of getting materials is sending caravans for them in exchange for price in coins. How can I get bronze/any other material? If you need it for a quest – just read the hint underneath the requirements. In case you need material for a building in shop, just hover over the material with your mouse. The last option, open your inventory (green backpack icon) and press materials tab. You can hover over each to see additional information like where you can get the material. What are the gems for? 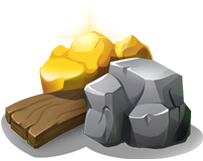 Gems can be bought with real money but they are also scattered here and there as loot in mines and they can be received from levelups and achievement rewards. Windmill is an item which you can send to your friends as a gift. When someone sends you one, you can accept it and then it will appear in your inventory in the tab "Windmills". After you put it on a friend's camp, it will give you 5 experience points and it will add 5 points to your friend's regeneration speed. They only last a certain time which is currently 7 days and a player can have maximum of 5 windmills. This limit can be extended if a player buys a special extra in the shop (Holland System 1 or Rotor Enhancer 1000). How can I get the Caravan Outpost and what does it do? The world map shows available and locked locations. Diggy can travel among these locations if they are not locked and progress in the story. What does a Repeatable mine mean? Repeatable mines are special mines with the restart indicator. They will start refreshing after the player clears the whole location by digging all the tiles. The mine is unavailable in the meantime and the restart lasts several hours. After the restart, the mine is again full of tiles and can be digged out over and over again. The restart can be sped up with gems. They are mostly the material or treasure mines with a chance of getting treasures. The most of them is located on the Repeatable map tab. I've encountered these strange round stones, what do I have to do with them? The round stones are a part of the most puzzles in Diggy's Adventure. They usually block your path and most of them need to be moved to a particular spot with a symbol on it. These stones can be both pushed and pulled so don't be afraid to play with them a bit. What is the bubble shining above a character's head? These "bubbles" appear when an NPC (Non-Player Character) wants to give Diggy a quest (bubble with a question mark) or finish a quest (bubble with an exclamation mark). Player has to click on the NPC itself to start a conversation. NPC's may appear and dissappear in the player's camp, in the town and also in the mines. If you don't know what else to do, always find an NPC with a bubble. By talking to an NPC with the question mark, you are given a quest which is indicated by an icon on the left side of the main screen. The quest window contains the title of the quest, the monologue from the NPC, hint (describes exactly what the player has to do to complete a quest) and mostly also a fast button which takes the player quickly to the quest location without manually clicking on the map and on the location itself. I have found a god child. What does it do? Finding a god child in the game is always useful. When clicking on it, it gives some amount of instant energy and coins to the player. After the first click, it moves to the player's camp. It runs around in the camp and sometimes, it can recharge and after clicking, the player is again rewarded with some amount of instant energy and coins. However, these children are not supposed to stay in the player's camp forever. After several clicks or a certain amount of time, they disappear. Why do some of my friends have these strange icons? This icon is a god child indicator. The children appear once a day at some of your friends' camps. That doesn't mean you are taking the children from them, it's only an additional bonus. A gift – bonus energy – can be sent to them after taking all the energy from their god children. This page was last modified on 18 May 2018, at 15:26. This page has been accessed 159,163 times.